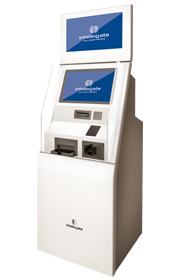 Solution replaces traditional currency exchange desk with automatic currency exchange branch that serves customers 24/7. Automatic currency exchange machines accept up to 5 currencies, reject counterfeit notes and proceed funds to the bank account. 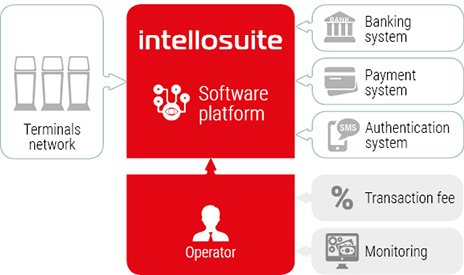 Intellosuite software platform allows to build expanded exchange business in several regions that use different currencies. Ready-to-use. There is no need to buy additional equipment, employ a cashier or rent a lot of space. Each terminal needs only one square meter to operate. All operations are remotely monitored by Intellosuite platform. Reduced expenses. Automatic currency exchange reduces expenses on the cash desk, human factor and at the same time it increases profit. Simplified management. At the end of the day Intellosuite displays detailed statistics about terminal network. The report shows how many banknotes remain in terminals, whether terminals need an encashment or repair.